Four Points Dermatology (Bee Cave) - Book Appointment Online! 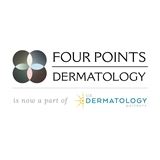 At Four Points Dermatology, now a part of U.S. Dermatology Partners, our professionals provide experience, expertise, and the latest technologies. We provide a high standard of medical and cosmetic dermatologic care to patients of all ages. From rashes to allergic reactions to acne and other chronic skin conditions, we are here to help you find relief. The receptionist helped me fill lout the form as well, very good experience! Quick and professional service. Sent my medication to a specialist pharmacy that then provided free and reduced priced meds that otherwise are very expensive! !